Motor Home Buyers: Swivel Seats – You asked for ’em, you got ’em! The design and engineering team for Gulf Stream Coach motor homes have responded to requests from RV’ers who have asked us to offer front seats that can swivel to face the living area. As a result of their work, several Conquest Class C and BT Cruiser floor plans now offer swivel seats as an option. Using the seats is easy – You simply pull a release on the side of the seat base. The release allows the seat to move back and away from the door, so there is enough room for the seat to turn around. As the seat moves, it disengages a locking pin, and when that pin is disengaged, the seat can swivel to face the main living area. The additional seating is great for yourself and friends, especially when the front seats are so comfortable and stylish. And when it’s time to hit the road, the release lever allows the seat to return to its forward position, held securely and safely in place by the locking pin that automatically snaps back into place. It’s good to know that all of the hardware, seat bases, seats, and seat-belt systems are safety-certified too. Availability of swiveling seats depends upon the floor plan and clearance, of course, so we’ve listed the possibilities below. As you can see, there are PLENTY of choices. 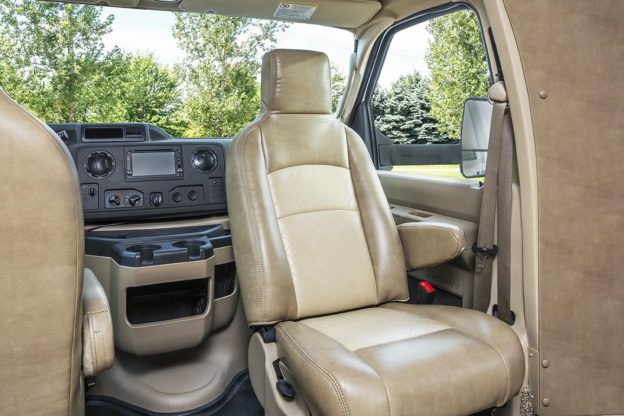 Make sure you include a Swivel Seat option when you order your BT Cruiser or Conquest Class C! This entry was posted in News on February 21, 2018 by pcampbell@gulfstreamcoach.com. 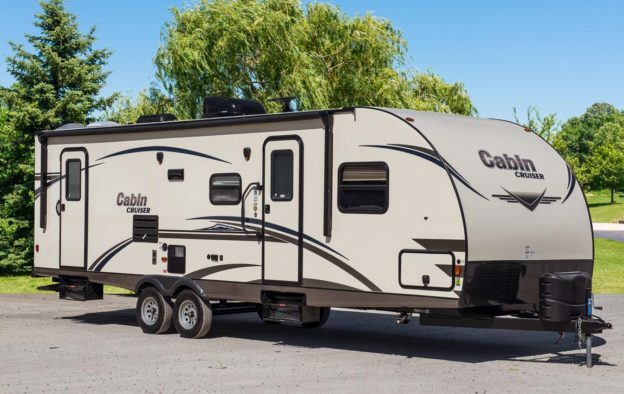 The design experts at Gulf Stream Coach have done it again – They’ve tapped into our sense of nostalgia and tradition to create a completely new travel trailer, and it’s called the Cabin Cruiser. 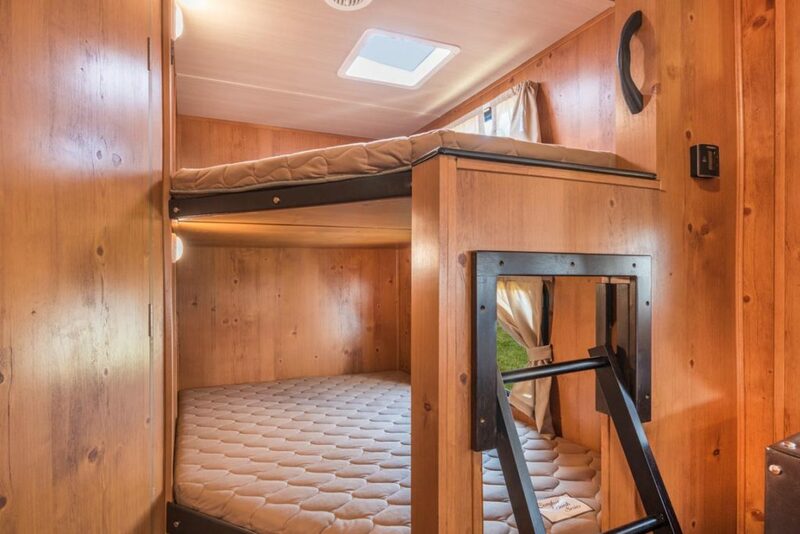 One look inside and you’ll be captivated by the warmth and charm of the knotty pine paneling that captures the look and feel of a classic yacht. The yachting connection holds up well in many ways. After all, our Cabin Cruiser is a rugged, comfortable, self-contained vessel that lets you cruise wherever your heart desires, and gives you a secure, and comfortable way escape, relax, share time with family, and entertain friends. It’s the “yachting lifestyle” without the waves – and without the huge price tag. The ‘hull’ of the Cabin Cruiser uses light yet rigid walls of welded square tube aluminum, with laminated layers of fiberglass, closed-cell poly foam insulation, and vinyl-clad paneling, to create a secure, climate-controlled living space. 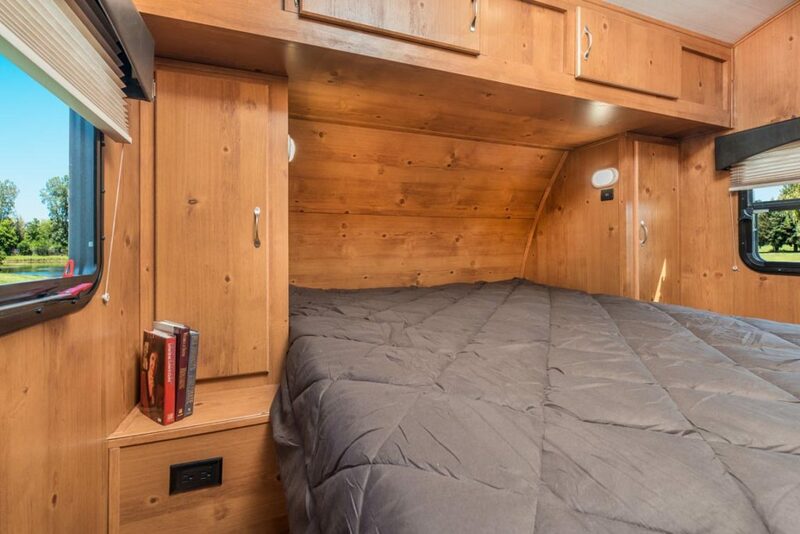 Of course there’s a complete kitchen, although in the Cabin Cruiser, you may want to call it a Galley. 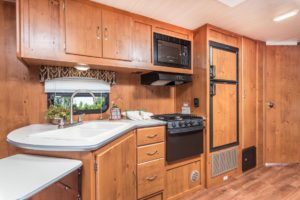 Either way, you’ll be able to create everything from snacks to full meals for the crew, with a double-bowl sink, range, oven, microwave, power vent, and double-door refrigerator/freezer. There’s a full bath too (sailors would call it the ‘head’) – with a washstand, wood medicine cabinet, tub/shower, skylight, power vent fan, and foot-flush toilet. 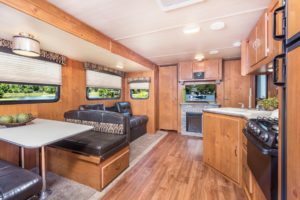 All the electronics you need to stay in touch with the world you’ve left behind are available, too, from HDTV to Blue-Tooth-enabled Home Theater sound, along with convenient 110 volt outlets, USB ports, connections for solar panel power, and hookups for a color backup camera. Our Cabin Cruiser is the “yacht” that lets you cruise the highways and byways in comfort, and dock wherever you find adventure and relaxation. Anchors aweigh! This entry was posted in News on February 9, 2018 by pcampbell@gulfstreamcoach.com.